Every great player has one thing in common, an unstoppable drive to improve their game. Being the best on the court comes from consistent, high-energy skills practice. Use HomeCourt™ to count, chart, and track your shots, giving you real-time stats with nothing but an iPhone and our patent pending mobile AI technology. Just shoot. No more uncomfortable sensors or expensive equipment. HomeCourt is ready to use everywhere you bring your iPhone. Just set up a tripod with a clear view of the court and hit start for real-time shot tracking and analysis. 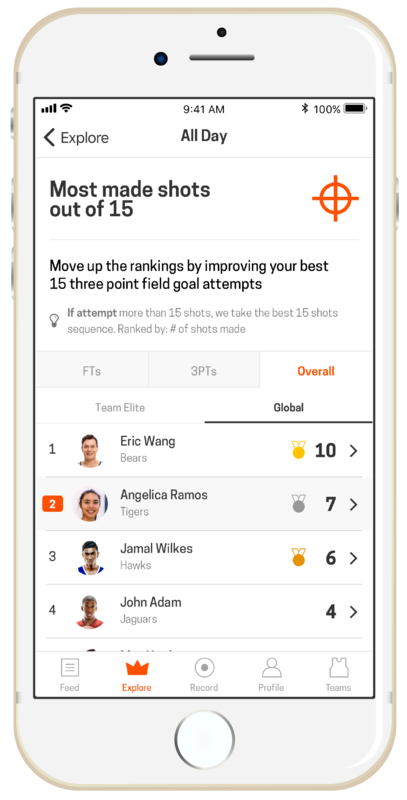 HomeCourt analyzes all your practice sessions, improving your game with deep stats analysis. Keep your head in the game, not on your shot count and watch your shooting percentages go up. iPhone is a registered trademark of Apple Inc. in the United States and other countries. AI-powered player tracking lets you review every shot you take in zoomed-in slow motion. Your session stats and videos are automatically shared with your coach and team. Set up a team leaderboard to add a fun competitive edge to your practice. Or, show the whole world your talents on our global leaderboard and get discovered. Our team product can instantly upgrade your gym into a smart gym with simple setup and advanced team features. Click here to order your team subscription. Track your shots. Up your game. Greatness awaits.